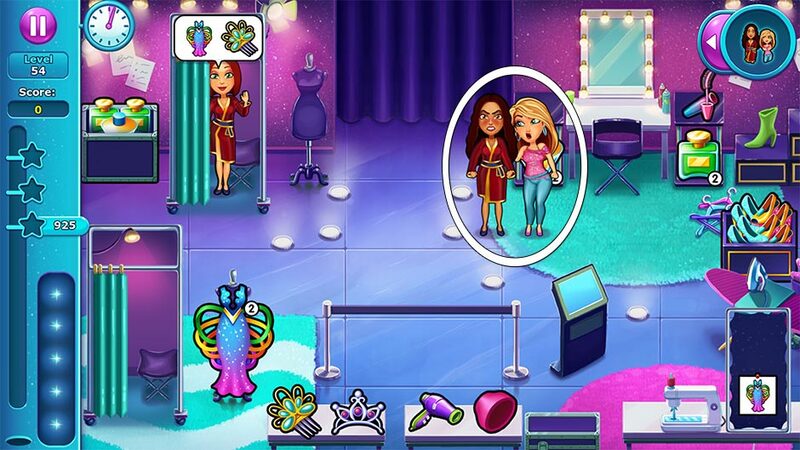 Welcome to the Fabulous – Angela’s True Colors Official Walkthrough! 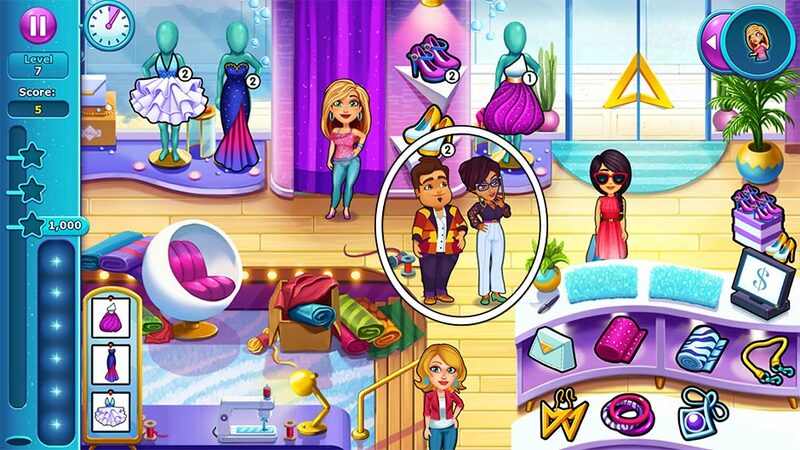 Join Angela on a brand new GameHouse Original Stories time management adventure and show off your fashion sense. 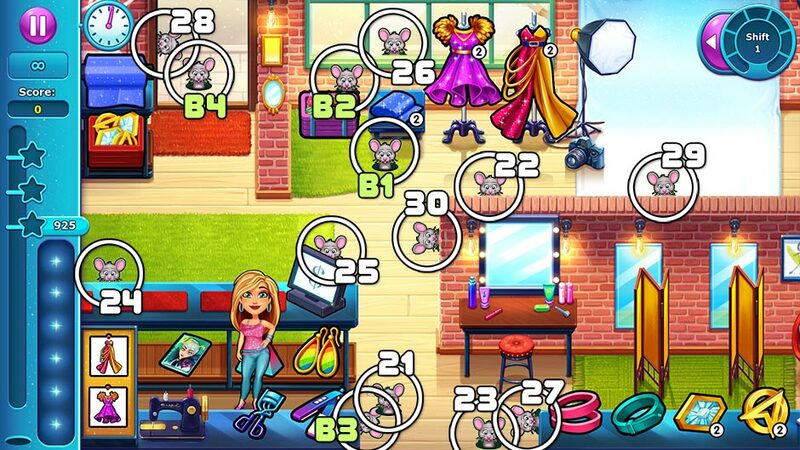 This is the official Fabulous – Angela’s True Colors strategy guide featuring all levels, bonus levels, mouse locations, trophies, and more! Choose a topic from the Contents below to get started. Get started on Fabulous – Angela’s True Colors the right way with the General Tips and Tricks section. Learn how to play, how to earn high score combos, how to master minigames, and bonus tips and tricks. Scroll down to get started. Fabulous – Angela’s True Colors is a time management game. The goal of the game is to assist as many people as possible within a limited period of time. The better your service, the higher your score will be! 1. Pick Up Products – Pick up the item or product the customer asks for by clicking the item matching the icon in their order bubble. 2. Deliver Products – Once you’ve gathered the items a customer wants, click on the customer to deliver them. 3. Checkout – When a customer has a money icon, they’re ready to pay! Click on the checkout monitor to collect their payment and earn a matching score. Customers Asking for Angela – Sometimes customers will need Angela’s help. Click on a customer with Angela’s icon to assist them. 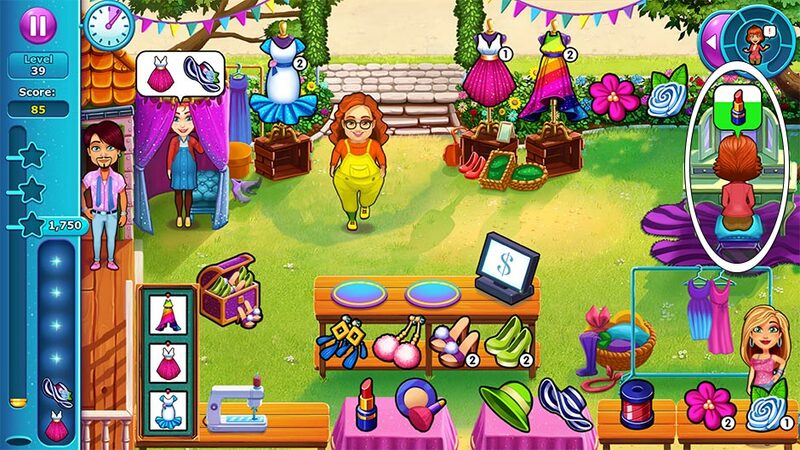 Minigames – Tasks such as assisting customers or creating dresses will sometimes involve a minigame. 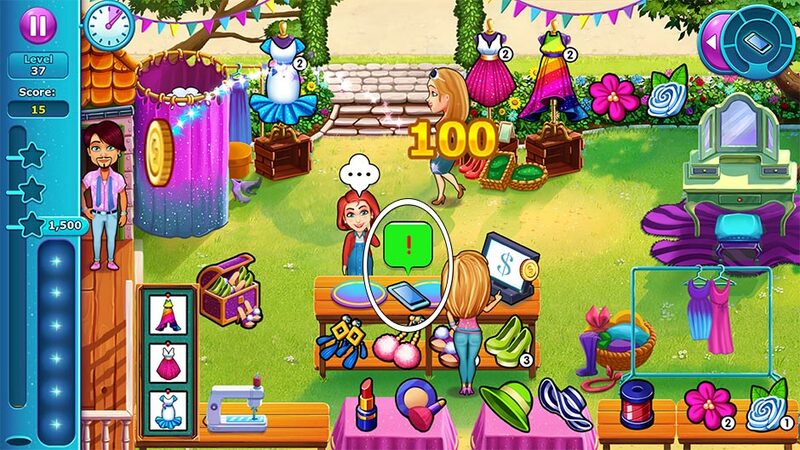 To play a minigame, click or tap the button displayed. If the button has an arrow, slide it in the direction indicated. If the button has a number, click on it in the order shown. If the button is yellow with a fan shape over top, tap and hold the button until the meter is filled. Cleaning – Fitting rooms and other stations sometimes require cleanup. Click a station marked with a “!” bubble to clean and prepare it for the next customer. The scores you earn are based off customers’ happiness. Customers with hearts are ecstatic and give the highest scores. Customers with thunderclouds are angry and give the lowest scores. If a customer becomes too angry, they’ll leave without giving a score! Pay close attention to customers’ expression to determine what kind of scores they’ll give. Customer mood can always be improved through excellent service. Checkout Combo – Check out multiple customers at the register at once. Cleaning Combo – Clean multiple stations back-to-back. Smart Combo – Give multiple customers all the items they ask for in a single trip, back-to-back. Full Order Bonus – Bring all the items a customer asks for in a single trip. Quick Bonus – Deliver all the products a customer asks for within a handful of seconds of their order. 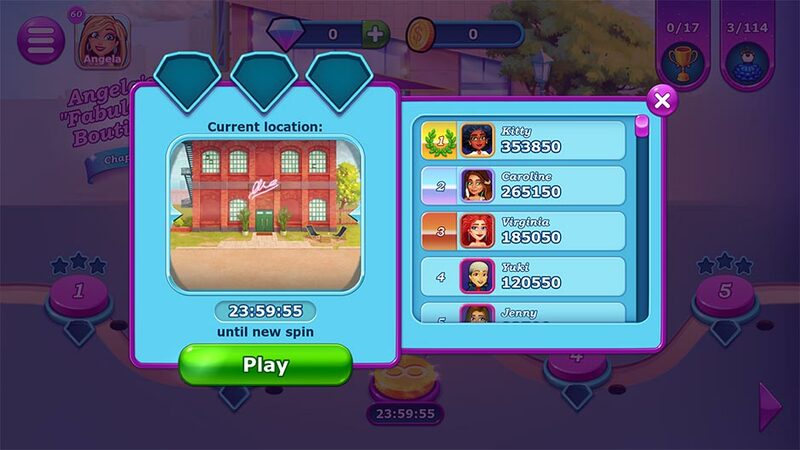 Minigame Quick Bonus – Complete a minigame within a few seconds of it starting. Spotless Bonus – Have all stations clean at the end of a level. 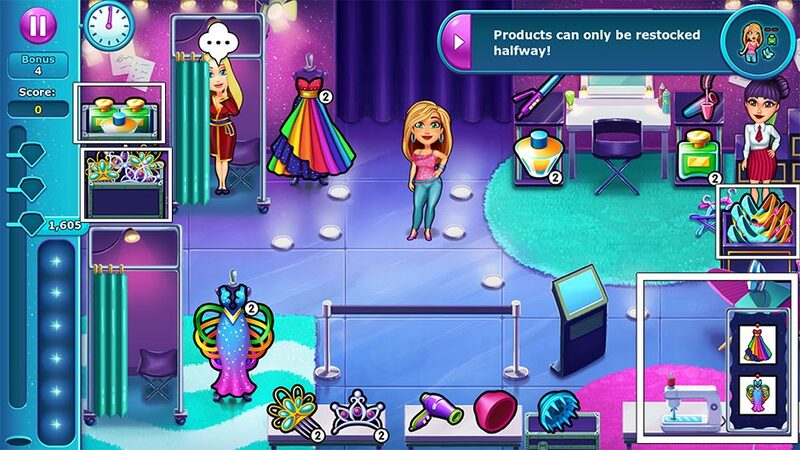 Fabulous – Angela’s True Colors features bonus endless levels. Endless levels can be accessed by clicking the infinite level icon at the bottom of the level select map. Every 24 hours, you can select this icon and spin for a new randomly-generated endless level. Earn bonus diamonds and beat your friends’ high scores! Each chapter and location features a unique set of unlockable upgrades. Select a level to open the upgrades shop. Using coins you’ve earned during service, you can purchase upgrades per location. Once unlocked, an upgrade will be unlocked permanently for that chapter’s location. Upgrades offer special gameplay bonuses, such as increased customer patience. Try unlocking all upgrades in all locations to earn a special achievement! 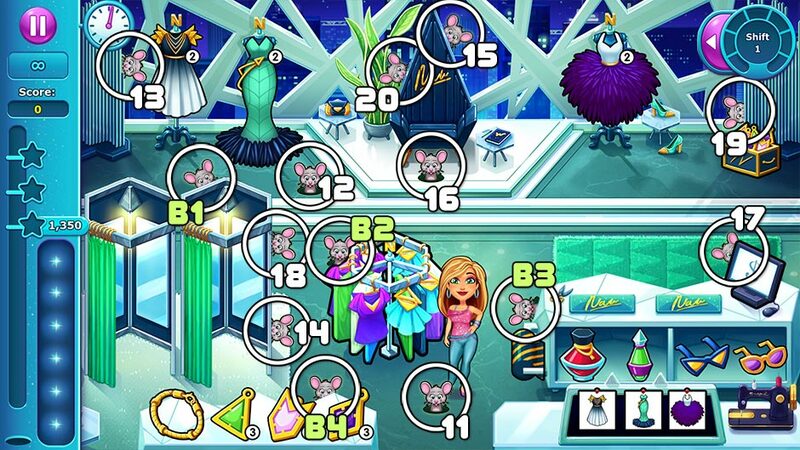 GameHouse celebrity Carl the mouse makes an appearance in Fabulous – Angela’s True Colors! More specifically, he makes a total of 86 appearances: Carl the mouse is hidden in each of the game’s story and bonus levels. 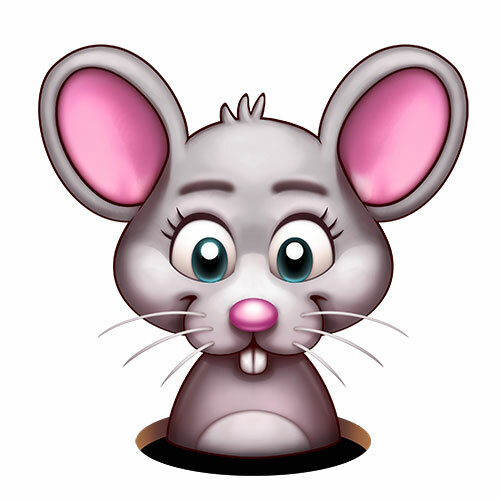 The mischievous rodent will pop up from time to time, so listen for his tell-tale squeak and click on him before he disappears! Click “Show Mouse Location” under any level in the walkthrough below to be taken straight to an image revealing Carl’s location. For a complete list of mice locations, go to the Mouse Locations section. Eek, a Mouse! – Carl the mouse is hiding in each of the game’s story and bonus levels. Keep a sharp ear and eye out for the sneaky rodent! This Cost a Fortune – Earn coins by completing levels. Coins can be used to purchase upgrades, and even diamonds! 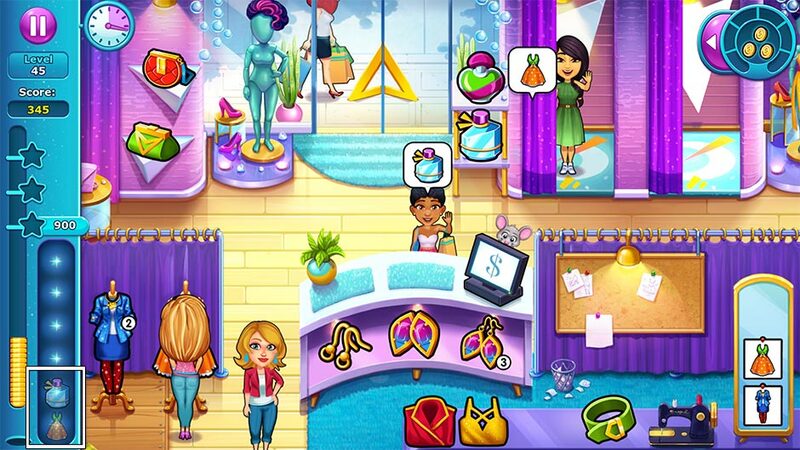 Diamonds are a Girl’s Best Friend – Earn diamonds by achieving high scores and earning stars in levels. Additional diamonds can be purchased by clicking the “+” icon next to the diamond tab in the level select map or dress-up screen. This Item is Limited Edition – Some items will only be available in limited stock. Small numbers beside items will indicate stock remaining. You can restock these items by clicking the corresponding restock boxes. Restock at the very start of the level to get ahead on service for the day! I Love It! – Ecstatic customers give the highest scores. These happy customers will display hearts when they’re at their happiest. Sparkling Clean! – Clean stations and dressing rooms before the last customer leaves to earn an extra score bonus at the end of the level. 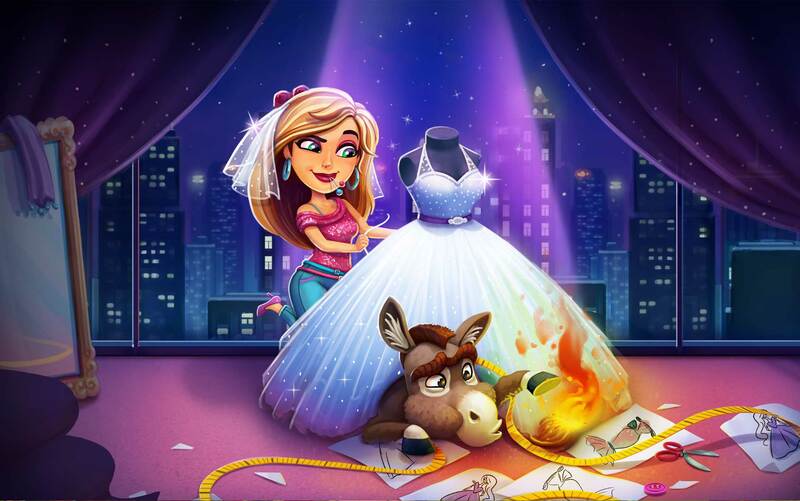 Dress for Success – Use diamonds you’ve earned to create your own dresses and outfits! 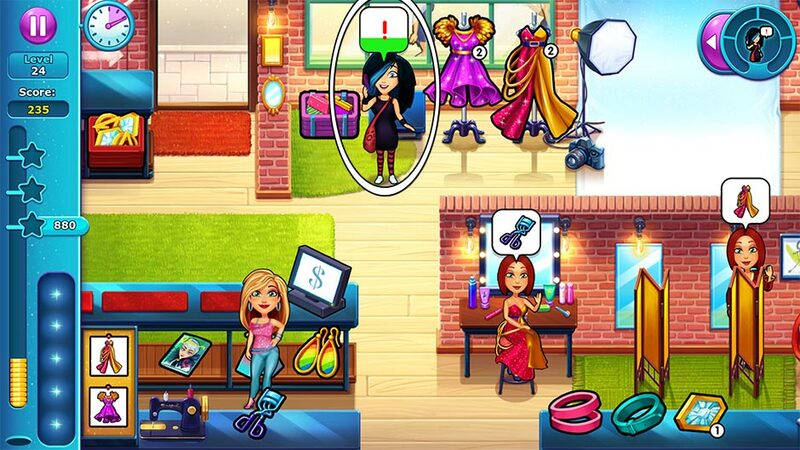 Click the dress icon in the upper right corner of the level select map: Buy clothing, dress your models, and save your creation as a wallpaper to share with your friends by clicking the camera icon. Simply Fabulous! 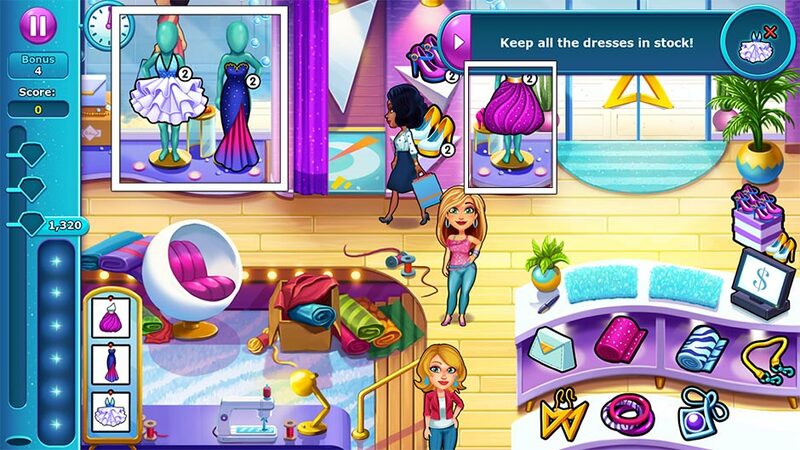 Fabulous – Angela’s True Colors Collector’s Edition – Dress Up! The Fabulous – Angela’s True Colors Official Walkthrough is a guide and does not contain cheats, hacks, or serials. 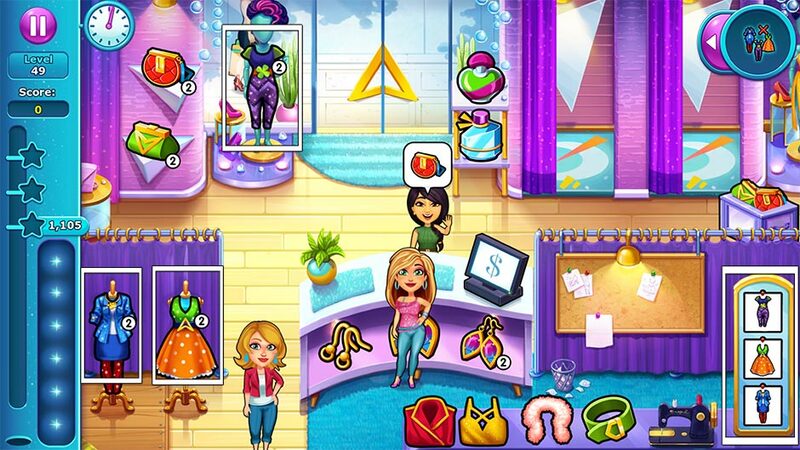 Welcome to the Fabulous – Angela’s True Colors Official Walkthrough. This is the complete official strategy guide for Fabulous – Angela’s True Colors and Fabulous – Angela’s True Colors Collector’s Edition. In this walkthrough you’ll find all story levels, bonus levels, mouse locations, trophies, and Easter eggs! Get started by choosing a topic from the list of Contents above or keep scrolling to dive right in. Make enough customers happy before they leave the store! 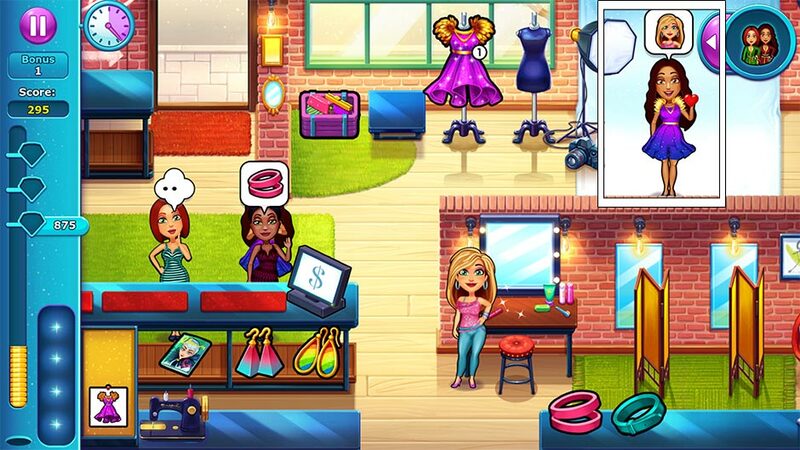 It’s your first day in the boutique! This first level will act as a tutorial and show you the ropes of how to play. 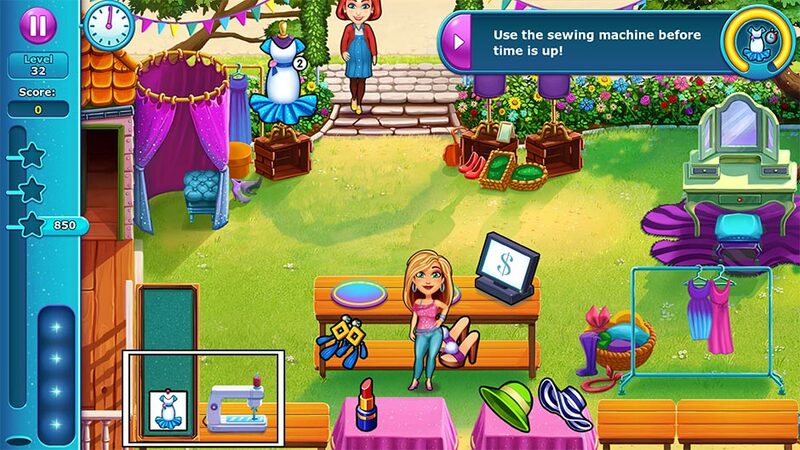 At the bottom of the screen is the sewing machine, which you’ll use to make dresses. 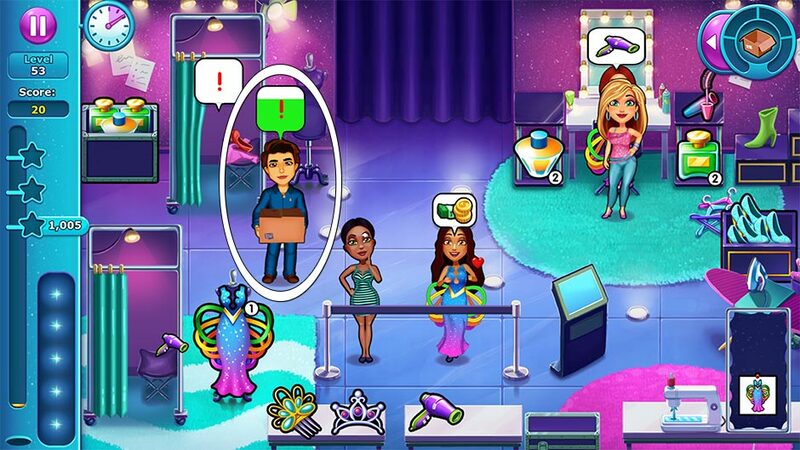 To the right is the checkout register, where you’ll collect money from customers. Make 3 customers ecstatic and leave with a heart! Bring customers the items they ask for without keeping them waiting to improve their mood and earn those hearts. Unpack your old fashion fringes. It’s time to unpack Angela’s old fashion fringes. At the start of the day, a box with a “!” bubble will be sitting on the left. Click on the box to begin unpacking. A meter will display your progress. Finish unpacking before the end of your shift to complete today’s story goal. Jenny brought two fashionistas. Make sure they are impressed! In addition to a new pair of shoes in the boutique, a new pair of fashionistas have arrived! Tend to the women each time they ask for an item. Make sure to serve them before the color drains from their bubble! Serve the women 4 times to complete today’s story goal. Put the finishing touches on your new dress! Angela’s newest creation is on the mannequin next to the dressing room. Complete her new dress before the end of your shift. A “!” bubble will appear over the dress at the start of the day. Once you click on the dress and begin working on it, a meter will appear displaying your progress. Finish it in style between serving customers and show them why you’re the best! Let Angela draw designs in her notebook! New to the boutique today is the purse, which will require some assembly. Click on the pieces in order to assemble the handbags. Besides this, Angela will want to draw some new dress designs in her notebook today. Click on the notebook in the lower left corner each time the “!” appears to have Angela sketch her designs. Complete this task 5 times to finish today’s bonus story challenge. The sale has just begun! Deliver only full orders to make customers happy! A new dress and necklace are in stock today, and customers will only want full orders! Make sure to bring customers all the items they ask for in a single trip to complete today’s bonus story challenge. Don’t let the committee members leave your boutique! The committee members have come to inspect the boutique. Don’t let them leave before your shift is done! In addition to the committee members, a new fabric for the handbag will become available today. Tip! You can click on the committee members at any time to have Angela encourage them back inside. You do not have to wait for them to move to the door first. Click on them as often as you like! Has a tornado passed through the store? 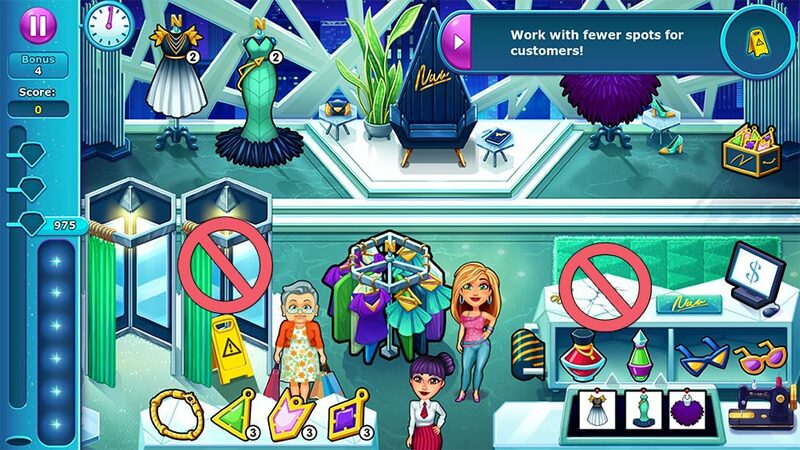 Clean your boutique! Clean the store! There are 3 piles of clothing materials lying around on the floor. Click on a stack to begin cleaning – a meter will appear displaying your progress. Clean up all 3 stacks before the end of your shift to complete today’s story challenge. A new collection is on the horizon! Help Angela find all her tools! Uh-oh, Angela’s missing her tools! Throughout the day, Angela will work on portions of her dress. An item bubble will appear over the mannequin with the orange fabric draped over its shoulders. Once the item is displayed, find the matching item lying on the floor, then take it to the mannequin to begin working on it. All item locations are circled and shown below. Tip! You can pick up these items early and store them on your tray, but they will take up space until they’re used. You can remove an item by clicking on it – the item will then return to its original location. An item will not count toward today’s goal until it’s been used on the mannequin. Safety first… but what about fashion? Angela must convince Officer Murray what’s more important! Talk to Officer Murray! Throughout the day, Officer Murray will enter the boutique. Click on the policeman whenever a “!” bubble appears over his head. Speak with the officer 3 times today to complete today’s story goal. Noemie’s store is so high fashion! Clean the fitting rooms within the time limit! Welcome to Noemie’s House of Fashion. 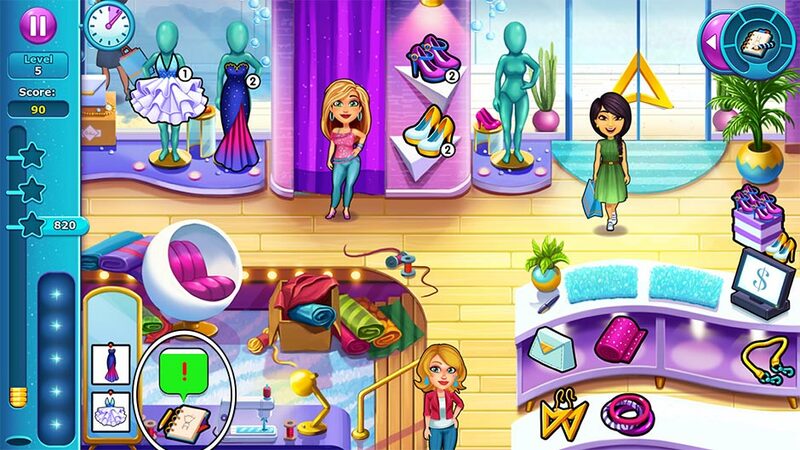 Your first story goal and today’s challenge is to clean all fitting rooms within the time limit. Every time a fitting room is left dirty, a “!” bubble will appear. Click on the fitting room to clean it before the color drains from the bubble. Repeat this for all fitting rooms today to complete today’s challenge. Angela wants to show Noemie her designs. Help her draw them in her notebook! Sketch out some new designs! Angela’s notebook is on the bottom counter beside the dress pattern. Click on the notebook every time a “!” bubble appears to sketch out a design. Draw out 4 designs before the end of your shift to complete today’s challenge. Sabotage? Help Angela find her tools! No second chances. Help Dominique pack her things. New to the House of Fashion is the cord charm bracelet. Click on the bracelet, followed by the charms to assemble it for customers. It’s also time to pack Dominique’s things. At the start of your shift, a box marked with a “!” bubble will appear in the upper left corner. Click on the box to begin packing. A meter will appear displaying your progress. Finish packing before the end of your shift to complete today’s story goal. There’s lots of new products today, including a new skirt, a new perfume, and a new type of charm. But even more exciting – listen in on Noemie’s conversation! Click on Noemie each time a “!” bubble appears before the color drains. Listen in on her conversation 5 times to complete today’s challenge. 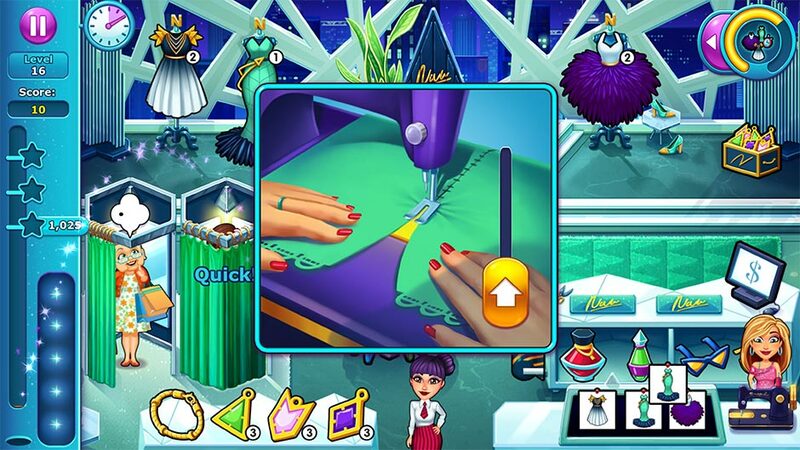 Show off Angela’s skills by creating dresses right on time! A new dress and charm are in stock today, and so is a new challenge for Angela! Create dresses within the time limit. A meter in the upper right corner will slowly drain. Each time you make a dress at the sewing machine, the meter will refill. Complete your shift without the meter ever completely draining to complete today’s challenge. Long night? Drink coffee and don’t let Angela fall asleep! It’s been a long night for Angela. Drink coffee to stay awake! Angela’s coffee cup is on the bottom counter next to the dress patterns. Click on the coffee cup every time a “!” appears to have Angela drink. Drink coffee a total of 5 times to complete today’s challenge. Honeymoon’s over. Serve Noemie by delivering her products! It’s time to cater to the queen herself. Serve Noemie during your shift! Noemie will order items just like any other customer, only she’s much more impatient! Treat her like royalty and place her as top priority during your shift today. Serve Noemie a total of 6 times to complete today’s challenge. Angela’s back on track. Play it smart by delivering products to multiple customers in a row! Play it smart and deliver multiple orders in a row! Bring at least 2 customers all the items they ask for back-to-back to earn a smart combo. Earn a total of 5 smart combos to complete today’s challenge. Final showdown! Make sure your project is the best! Finish designing Angela’s dress! Angela’s notebook is on the bottom counter next to the dress patterns. Click on her notebook each time the “!” appears to work toward completing her dress. Work in Angela’s notebook 5 times to complete today’s challenge. A bunch of aspiring models want to work for you! Collect their portfolios! Collect portfolios from new aspiring models. Throughout the day, models will enter the studio and offer Angela their portfolio. A “!” bubble will appear whenever a model wants to share their work. Click on the model to collect their portfolio. Collect 3 portfolios before the end of your shift to complete this level’s story goal. The models are annoyed. Make sure to check them out within the time limit! Check out the models within the time limit! A meter in the upper right corner will empty over time. Check a model out at the register before the meter empties to refill it. Complete your shift without a single model leaving or the meter emptying to complete today’s challenge. Finish assembling Angela’s dress! Angela’s dress is next to the photo area and marked with a “!” bubble at the start of the day. Click on the dress to begin assembly. A meter will appear showing your progress. 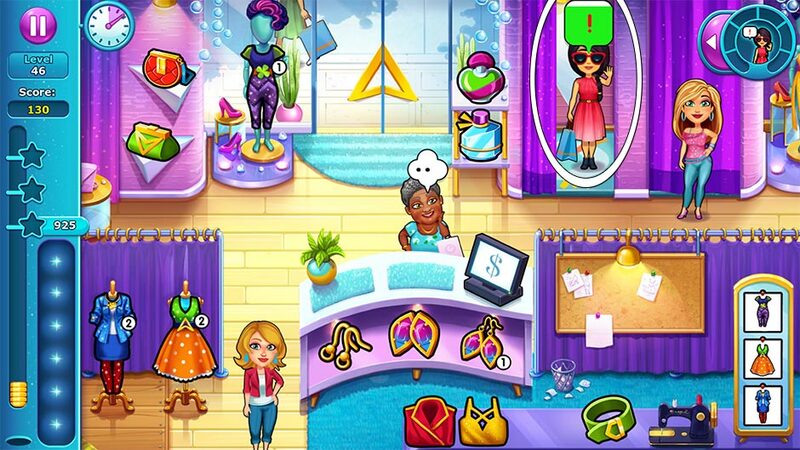 Finish putting Angela’s dress together before the end of your shift to complete today’s challenge. Chloe is waiting on the phone. Try to discuss the meeting details with her. A new clutch purse and bracelet gem will be added to your products today. Also new is the appearance of Chloe! Try and talk with Chloe during your shift. Each time a “!” bubble appears over her, click on Chloe to speak with her. Talk with Chloe a total of 4 times today to complete this level’s story goal. Clean the studio after the meeting. The studio is a mess today! Clean it all up before your shift ends. There are 3 locations in need of a good cleaning. Click on a dirty spot to begin cleaning – a meter will show your progress. 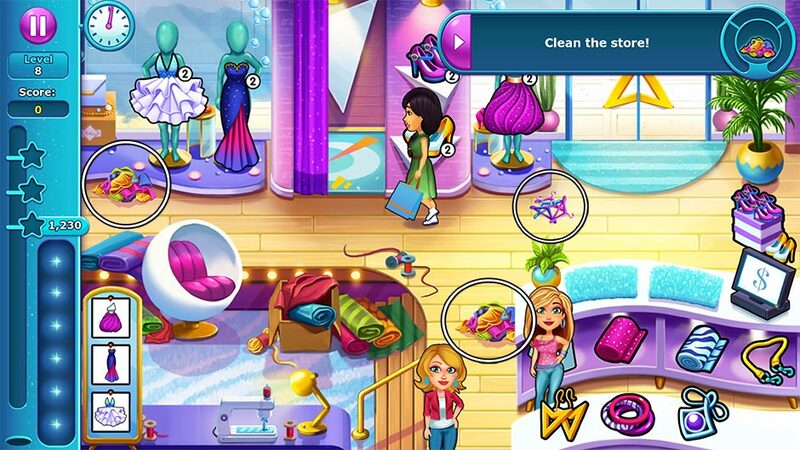 Finish cleaning all 3 areas in the studio before the end of your shift to complete today’s story challenge. It’s gonna be fabulous. Check out five or more models at once! A fabulous new hair straightener has been added to today’s products, and today’s goal is all about getting fabulous combos! Check out 5 people at the register at once to earn a fabulous combo and complete today’s challenge. New to the studio today is extra fabric to add to the bottom lining of a dress. Pay close attention to the dresses being ordered. If the bottom of the dress has a blue-violet color, select the fabric before selecting the dress to combine them. Additionally, today’s story challenge is to take Yuki’s measurements. Yuki will be in the dressing booth in the lower right corner. Click on Yuki to measure here every time a bubble pops up with Angela’s picture. Measure Yuki 4 times to complete today’s challenge. Angela’s dress needs some alterations. Click on the dress marked with a “!” bubble at the start of the day to begin alterations. A meter will appear displaying your progress. 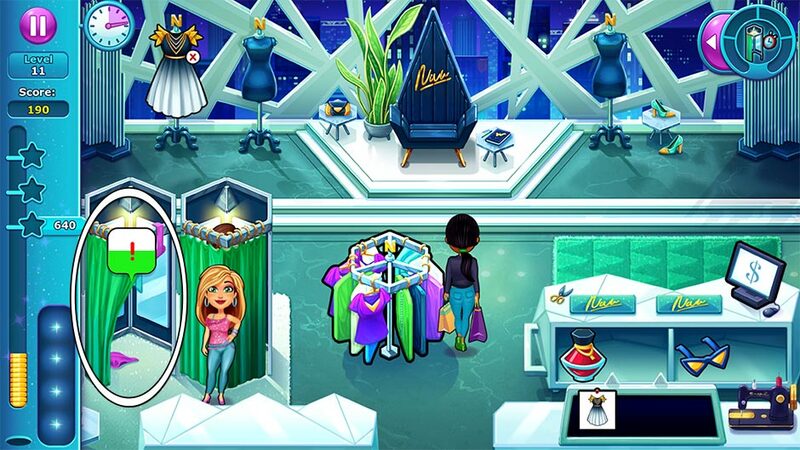 Finish altering Angela’s dress before the end of your shift to complete today’s story challenge. The photo shoot props are coming in! Accept them. Collect the deliveries from Chloe. Throughout your shift, Chloe will appear with boxes. Click on her once the “!” bubble appears to collect a package. Collect 4 packages before the end of your shift to complete this level’s bonus story challenge. Photo fragments are everywhere! Can you find them all? Snuggford makeover time! Make sure 6 customers leave Emily’s garden happy! 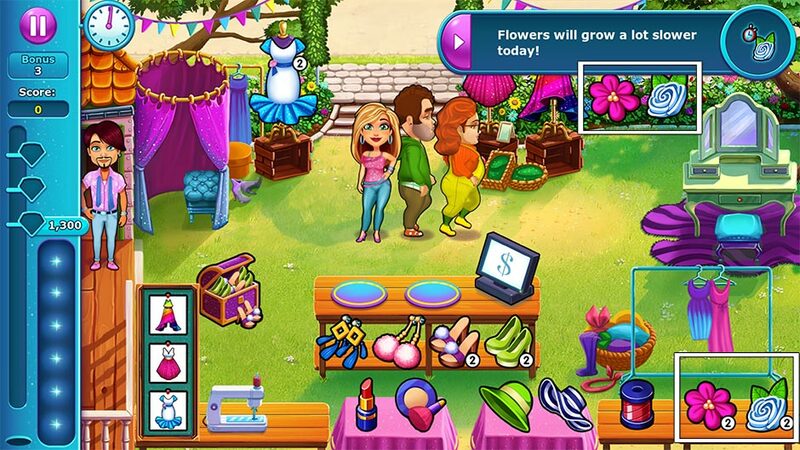 Emily’s Garden is all about happiness, so make sure 6 customers leave with a heart! Serve full orders quickly to make customers ecstatic. Ecstatic customers will have a heart and a huge smile to accompany it. Check out 6 ecstatic customers to complete today’s challenge. Time to get back to work! Keep yourself busy by making dresses. Use the sewing machine before time is up! A meter in the upper right corner will keep track of how much time you have remaining. Each time you make a dress using the sewing machine, the meter will reset. Complete the day without the meter ever completely emptying to finish this level’s bonus challenge. Angela and Francois came up with a fabulous makeover. Try it on Edward first! There’s new makeup in stock today, and with it comes a new makeover! 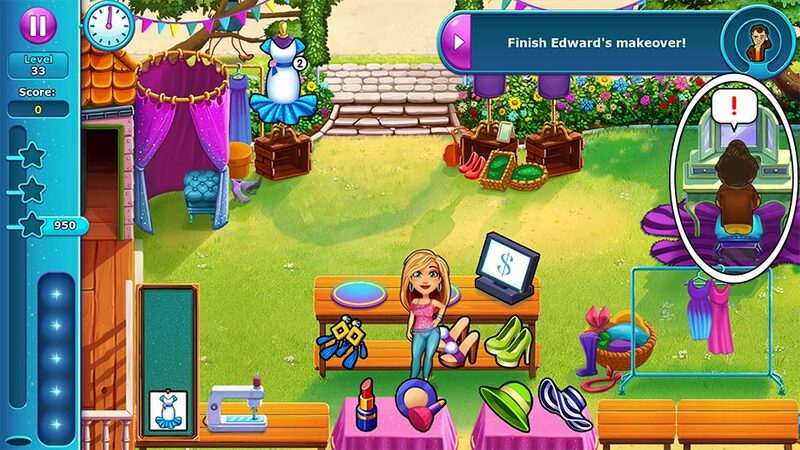 Finish Edward’s makeover. Edward is sitting on the right with a “!” bubble over his head. 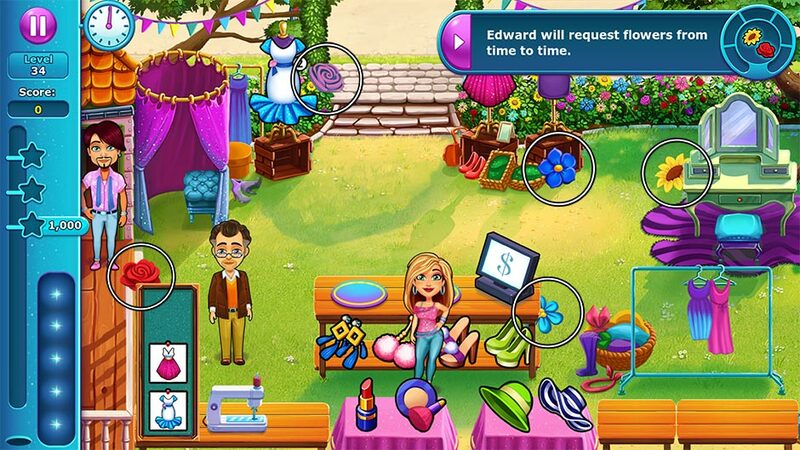 Click on Edward to work on his makeover. The meter in the upper right corner will keep track of your progress. 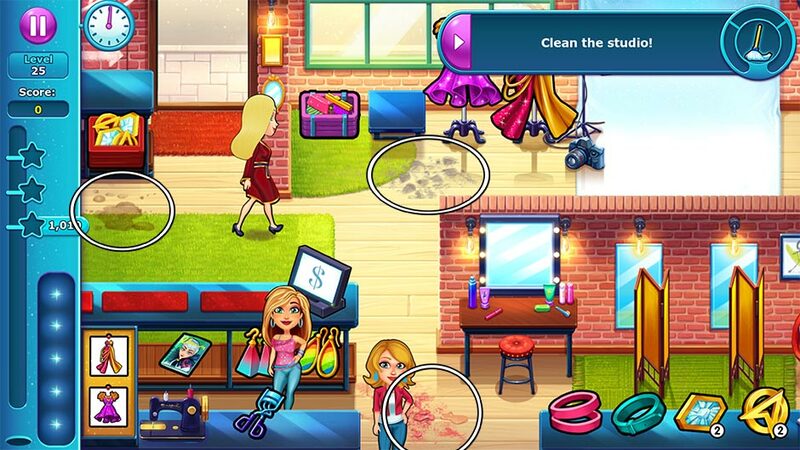 Complete his makeover before time’s up to finish this story challenge. Edward needs to make peace with Evelyn. Help him! Edward will request flowers from time to time today. There are 5 flowers scattered throughout Emily’s Garden. When Edward requests a flower, find the flower he asks for, then bring it to him to complete the task. Bring Edward all 5 flowers upon his request to complete today’s challenge. Flower locations are pictured below. Tip! You can pick up the flowers before Edward asks for them, but they’ll take up space on your tray. To remove a flower, click on it while it’s on your tray. It will return to the location where you found it. Sally will be the hairdresser today! Help her create some great hairstyles! Ribbon and flowers will be added to your stock as optional hat accessories today. The only thing more fabulous than these accessories is hairdresser Sally! Help Sally every time she asks for help today. A “!” bubble will appear over her whenever she needs help. Click on Sally to assist her – a meter will appear displaying your progress. Help Sally 3 separate times to complete today’s challenge. 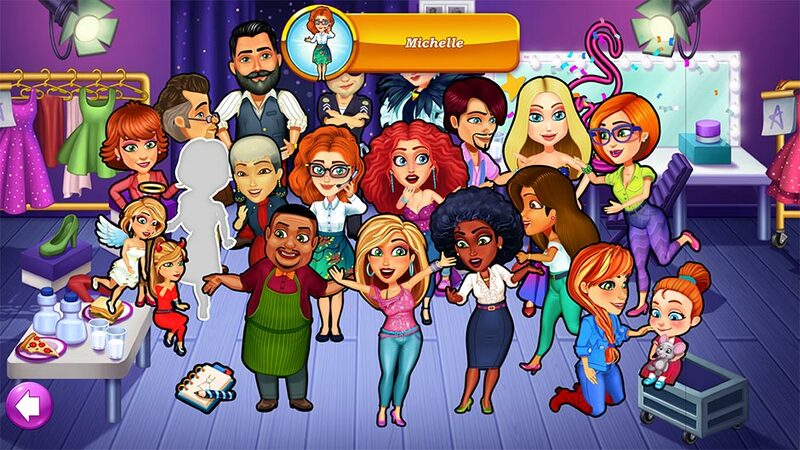 Show off Angela’s skills and get lots of quick bonuses! A new dress has been added to the rack today showing off Angela’s design skills. Show off Angela’s service skills by earning quick bonuses! Serve or assist customers within a few seconds of their order to earn a quick bonus. Earn 7 quick bonuses by the end of your shift to complete today’s story challenge. Angela’s friends are trying to contact her, but she’s not ready yet. A new hat accessory has been added to your fashion lineup today. Throughout the day, Angela’s friends will try to contact her. Angela’s phone is sitting on the checkout counter and will ring when the “!” bubble appears. Click on the phone to have Angela view her messages. Check Angela’s phone 5 times today to complete the challenge. Edward and Evelyn are still not speaking much. Try to cheer him up. Try to cheer up Edward. Throughout the day, Edward will have bouts of insecurity and a “!” bubble will appear. Click on Edward before the color drains from the bubble to reassure him. Continue to reassure Edward throughout the day successfully to complete the challenge. Finish Evelyn’s makeover! Bring Evelyn the items she asks for during your shift. Bring Evelyn 5 items total to complete this level’s story challenge. Angela is going back to New York! Help her pack. It’s time to get going! 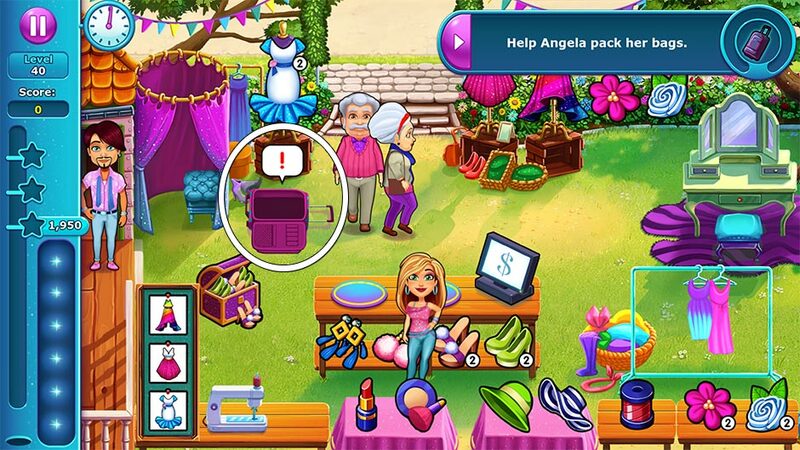 Help Angela pack her bags by clicking the suitcase marked with a “!” bubble. A meter will appear displaying your progress. Finish packing before the day ends to achieve today’s story goal. Bon voyage! 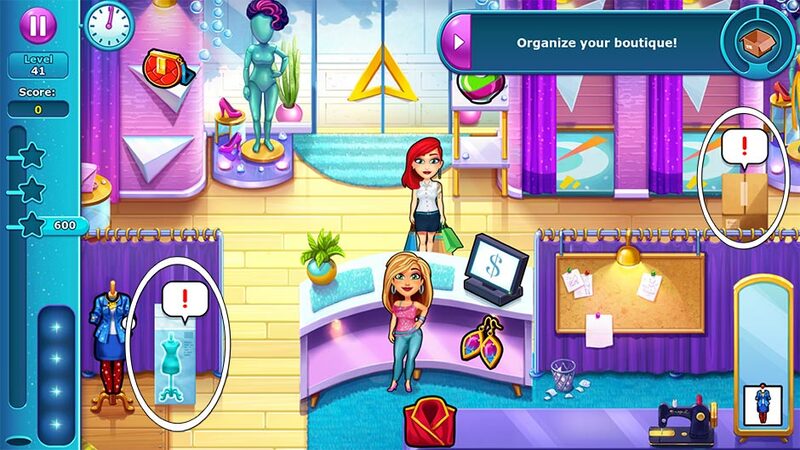 Welcome back to Angela’s “Fabulous” Boutique – it’s time to organize a few things! Two areas of the boutique are marked with “!” bubbles. Click on these areas to begin organizing. A meter will appear showing your progress. Finish organizing both areas before the end of your shift to complete today’s challenge. Sketch some ideas for your collection! Draw new dress designs in your notebook! Angela’s notebook is located underneath the checkout counter. Each time a “!” bubble appears over the notebook, click on it to begin sketching ideas. Help Angela sketch out 5 ideas before the end of her shift to complete today’s challenge. Check out the happy customers! Customers are thrilled about the new dress and top in stock today. Keep them happy by serving them full orders quickly and let the love roll in! Check out 8 ecstatic customers with hearts to complete today’s challenge. Keep those pesky paparazzi away! Photographers will enter Angela’s boutique trying to sneak photos. Click on the paparazzi when the “!” bubble appears to confront them and shoo them away. 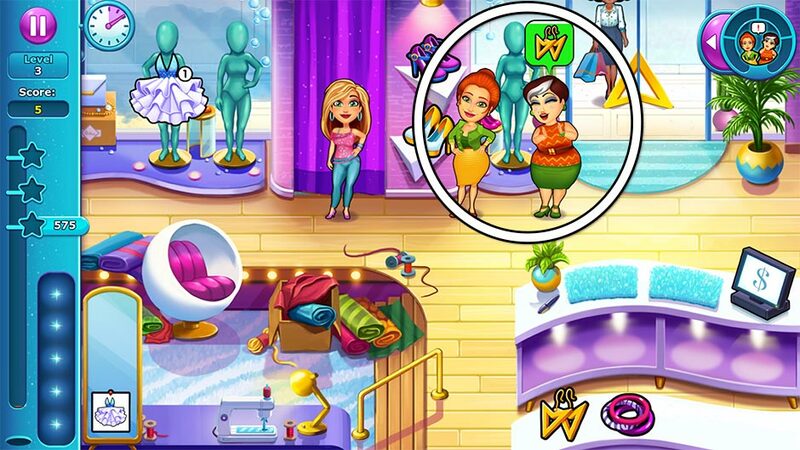 Get rid of 5 paparazzi to complete this level’s story challenge. Play it smart and make smart combos! Serve at least 2 customers all the items they ask for back-to-back to earn a smart combo. Earn 6 smart bonuses before the end of your shift to complete this level’s story challenge. There’s a special customer in the boutique today. Tend to them by clicking on them each time the “!” bubble appears. 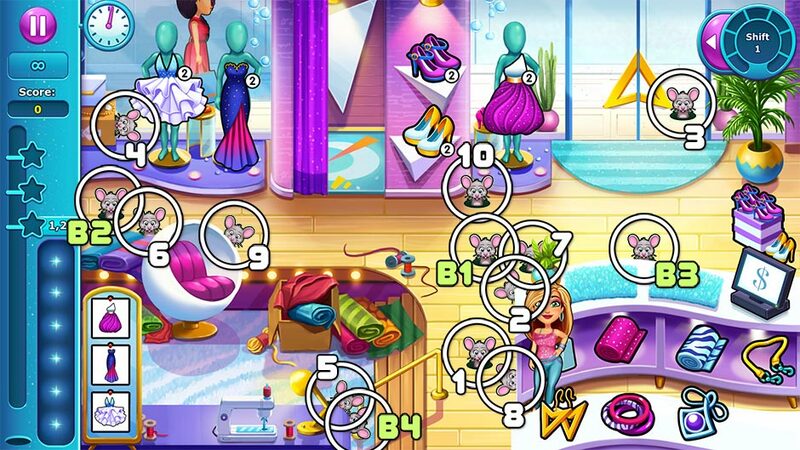 Assist the VIP 6 times before the color drains from her bubble to complete today’s challenge. Finish your piece de resistance! It’s time to finish Angela’s dress! The dress Angela is working on is located on the left, between the dresses and the purses. Throughout the day, bubbles will pop up over the dress displaying an item. Locate the item hidden in the boutique, then click on the dress to use it. 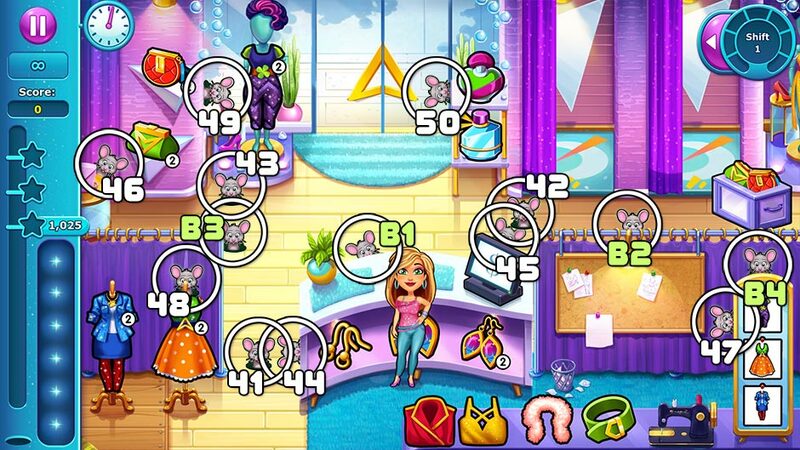 Locate and use all 4 items before the end of the day to complete this level’s challenge. Item locations are pictured below. Tip! You can pick up the items needed for today’s story goal before they’re needed for the dress and they’ll be added to your inventory. However, they will take up slots on your tray. Click on an item to remove it. Removing any of these items will return it to the location where it was found. Don’t stand for too long! Keep Angela moving! Don’t let Angela stand still for too long today. A meter in the upper right corner will help you keep track. Alternate clicking between the two dressing booths to keep Angela moving! Regardless of whether or not the booth is in use, Angela will still move between them, putting you in an ideal place to complete this level’s challenge. Don’t run out of dresses! Always have enough dresses! Don’t let any dresses or outfits run out of stock today. The small numbers displayed next to the mannequins will let you know how many you have remaining. Restock dresses as needed by using the sewing machine. Only serve one product at a time during the whole level! Take products to customers one at a time today. Only bring a single item at a time. You can carry more than 1 item on your tray but be careful – if you serve more than one item, you’ll need to replay today’s challenge. Serve 12 individual items to complete today’s goal. 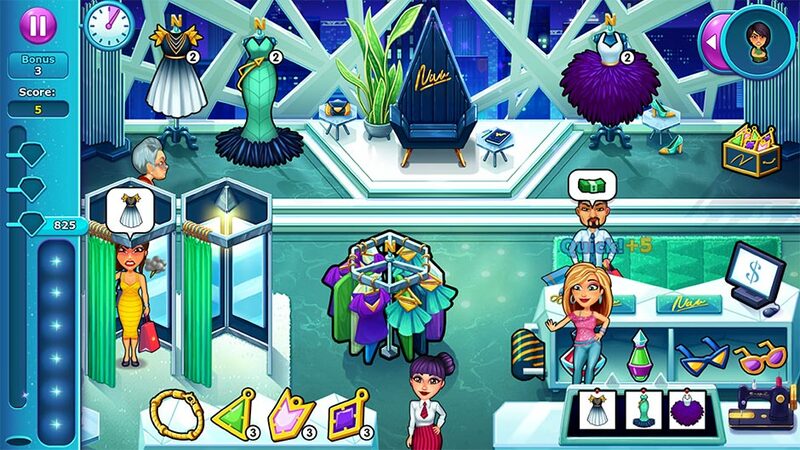 Shine during Fashion Week! Get enough smart bonuses! Earn 5 smart bonuses. Bring two models the products they ask for back-to-back to earn a smart bonus. Earn a total of 5 smart bonuses before the end of your shift to complete today’s challenge. The models are annoyed. Make sure to check them out before time runs out. Check out the models within the time limit! The meter in the upper right corner will help you keep track of your progress. Never let the meter empty. Instead, every time you check out a model, the meter will reset. Carefully manage your time to complete this challenge. Angela needs more styling products. Pick up the deliveries. Packages are showing up today. Click on the deliveryman every time he appears. A “!” bubble will appear whenever a box needs to be picked up. Click on him to collect the package. Pick up 4 packages from the deliveryman to complete this level’s challenge. The models are close to quitting because of the food. Stop them from leaving. New items are in stock today, but it’s not enough to keep the models happy! Angry models will attempt to storm off during your shift. Click on an angry model to talk to her and reset her position. Keep any of the models from storming off to complete today’s challenge. Tip! You can talk to angry models as often as you like. You can also wait to talk to them but be careful not to wait too long! Josh is away on a photo shoot, but Yuki needs him! Try to contact him! More new products have been added today, and it’s time to call Josh. Click on Angela’s phone at the bottom of the screen every time the “!” bubble appears. Try to speak with Josh 5 times over the phone to complete the challenge. The sewing machine starts breaking down at the least convenient moments. Fix the sewing machine before it completely breaks down. The sewing machine will start to spark and a “!” bubble appear when it begins to malfunction. Quickly click on the sewing machine to get it back into working order. Fix the sewing machine 6 times during your shift to complete today’s story challenge. Francois is delivering dresses because the sewing machine is broken! Francois will deliver dresses today. Click on a dress pattern to have Francois retrieve the matching dress. Tip! Since Angela won’t need to sew any dresses today, click on patterns as often as you like to have Francois keep dresses fully stocked. Angela needs to keep herself busy to stay calm. Make dresses. LOTS OF THEM. Complete a dress every 30 seconds. A timer in the upper right corner will deplete over time and keep track of your progress. Each time you make a dress, the meter will reset. 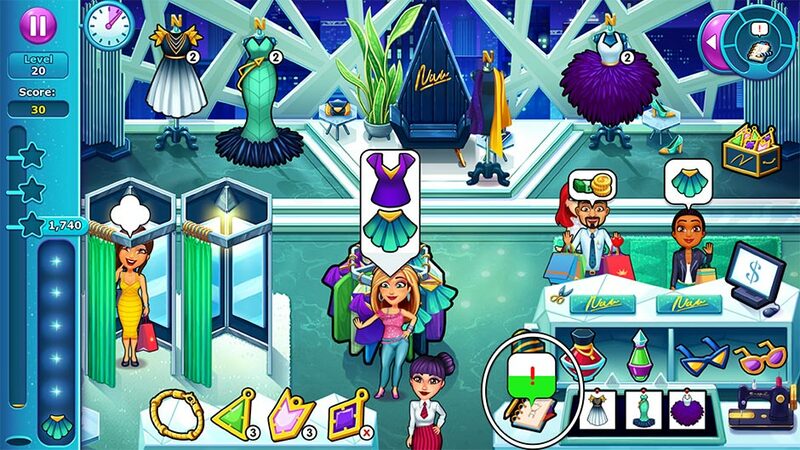 Make a dress every 30 seconds or less throughout your shift to complete this level’s challenge. Yuki is not feeling well. Give her a glass of water whenever she needs one. Give Yuki a glass of water! Yuki’s glass is sitting next to the sewing machine. Every time Yuki feels nauseous, click on the glass, then click on Yuki to hand it to her. Give Yuki 5 glasses of water during your shift to complete the challenge. It’s time to focus! Deliver only full orders! Full orders only! Today is all or nothing. Bring all the items models ask for in a single trip, and don’t leave anything out! Complete your shift without leaving out a single item to finish this story goal. Congratulations! You’ve completed Fabulous – Angela’s True Colors! 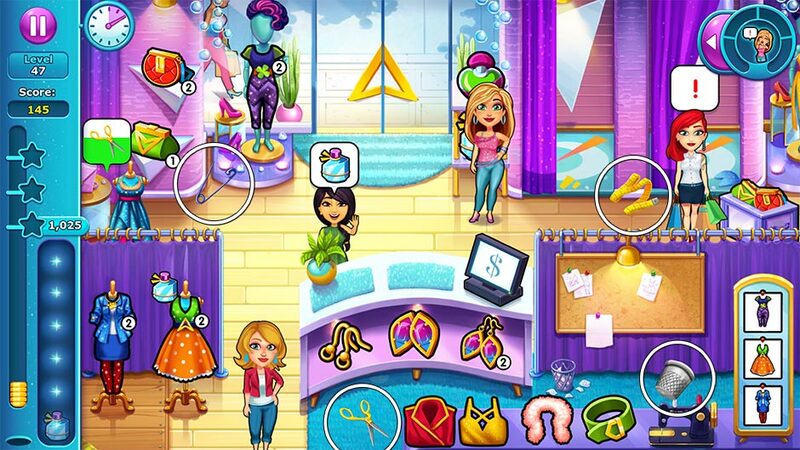 Fabulous – Angela’s True Colors features 24 bonus challenge levels: 4 per chapter. Bonus levels offer unique objectives and rewards. If you need help completing a bonus challenge, then this section is for you! Scroll down to get started. Clean out the family of mice that has infested Angela’s boutique! Carl the mouse is back, and he’s brought his entire family with him! Listen for the tell-tale squeak and find 9 mice during your shift to complete this challenge. All possible mouse locations are shown below. Serving customers quickly will be the only way to earn points! Get lots of quick bonuses by delivering orders fast! Quick bonuses can be earned by serving customers within a few seconds of their ordering. Focus on serving customers fast. This will be the only way to earn points that count toward this level’s score. Another busy day. Keep Angela moving! Keep Angela moving and on her toes! Don’t let Angela stand still for too long at any point. A meter in the upper right corner will keep track of how long you have to move again. Alternate clicking between the dressing room and the chair to keep Angela moving without adding any extra items to your tray. 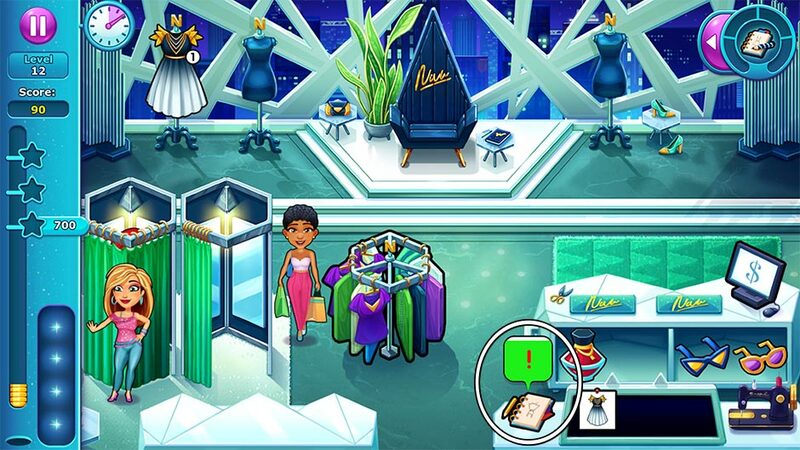 Make sure you keep all your dresses in stock throughout the level! Keep all dresses in stock! The small numbers shown next to the dresses display how many are left in stock. 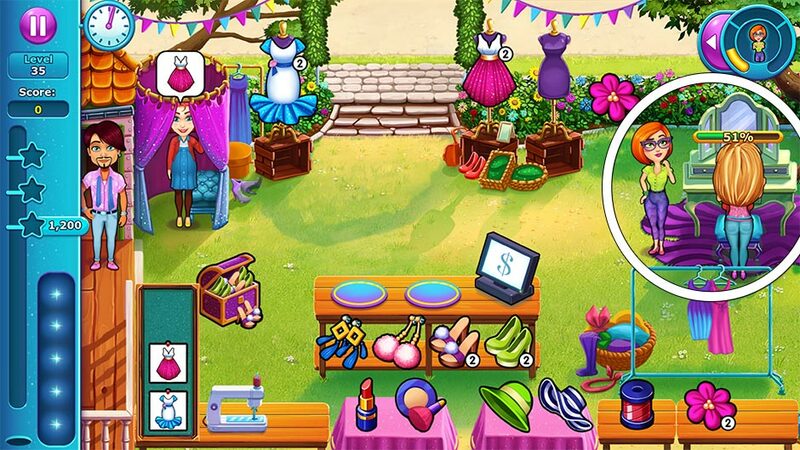 Create new dresses by selecting a pattern next to the sewing machine and completing the minigame. Finish your shift without ever running out of stock to complete this challenge. Can someone please fix that sewing machine? It keeps breaking down! The sewing machine keeps breaking down today. Click on the sewing machine every time the “!” bubble appears to fix it. Tip! You will only be able to make dresses when the sewing machine isn’t malfunctioning. Try selecting a low-stock pattern after fixing the machine to stay on top of things. Impress Noemie by only serving full orders! Only serve full orders! Bring all customers all the products they ask for in a single trip and never split orders to complete this challenge. Uh-oh… Is something afoot? Everyone seems so angry! Serve angry customers! Everyone is in a bad mood today. Focus on serving customers quickly – especially those with lightning clouds beside them. The quicker you serve them, the more their mood will improve. Be careful not to make anyone wait too long today, or they’ll leave without giving you money or a score! Something, or someone, damaged the counter and a fitting room! There’s less room for customers now. Work with fewer spots for customers! One dressing room and one of the checkout counter spaces will be out of order today. Keep customers rolling and don’t keep anyone waiting. It’s especially important to keep the dressing room clean and customers moving at checkout, or else people may leave without paying. All the models from the makeup and fitting stations want to take a picture today! Models from the makeup and fitting stations will want to have a picture taken today. The photo area will be popular with all models, meaning you’ll have to keep things moving! Focus on tending to models in the photo area today. Everyone’s moving super fast today! Super speed! Everyone moves much faster today. Playing this level works just like any other – it’s just sped up faster! Don’t be afraid to take an extra moment if you find yourself overwhelmed at any point today. Focus on the tasks at hand. We have a problem. Every product that can be stocked can only have half the usual amount today. Products can only be restocked halfway today. You’ll only be able to keep 2 of any item in stock at a time. Restock items by clicking on the corresponding boxes. The models want everything for free. Only bonuses will give you points! Only bonuses will give you points today. Serving quick orders, full orders, smart orders, and checking out multiple models at once will all reward bonus points. Don’t forget to keep dressing booths clean for an extra bonus at the end of the day! Angela is very tired today. Make sure she walks no more than 400 meters! Keep movement limited and don’t walk more than 400 yards today. Try and group tasks to minimize Angela’s movement. Tip! You can minimize movement by limiting your trips to the sewing machine. Try fully restocking dresses before leaving the sewing machine to cut down on steps today. Make sure the customers are as happy as possible! Check out 8 ecstatic customers with hearts. By serving full orders quickly, you’ll improve customers’ moods. If they were happy to begin with, customers will become ecstatic! Flowers will grow much slower today. Stock up when you can! Flowers will grow a lot slower today. Restock flowers by clicking on the flowers on the bush in the upper right corner. It’s recommended you restock at the very start of the day to allow more time for flowers to grow. The sewing machine is broken. Emily will deliver dresses today. Emily will be in charge of delivering dresses today. 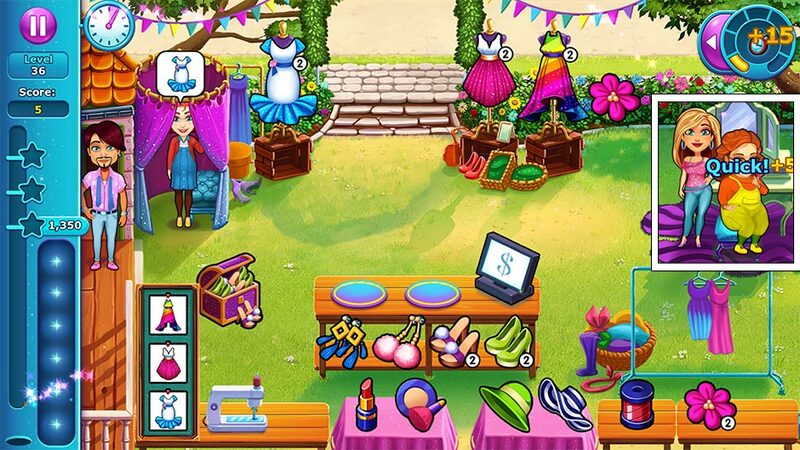 Instead of sewing new dresses, click on a dress pattern to have Emily retrieve it. The mice family strikes again! This time they brought friends! The customers’ mood drops fast! Customers will lose patience more quickly today. Focus on serving customers quick, full orders to help them feel better. Not many customers will come in today. Manage them wisely! Fewer customers will come in today. Manage them wisely! Take extra care when serving customers to bring them everything they need quickly. Try not to keep them waiting at the register, either – it’s better to keep customers happy to improve your score. Focus on keeping your customers happy. You will get points based on how happy they are! Customers will pay relative to how happy they are today. The happier a customer is, the better they’ll pay! Tip! If you find yourself running behind with a customer, focus on everyone else. It’s better to have one customer with a low happiness score and the others happy than several with a medium score and happiness level. Only cleaning combos count towards the score. Only cleaning combos will count toward your score today. Don’t clean dressing rooms right away. Instead, leave the dressing rooms dirty until all 3 stations have “!” bubbles and need cleaning. Clean all 3 stations back-to-back to multiply your score. A single 3-in-a-row cleaning will fill over half your score meter today. Most models will make big orders. The models will make big orders today. Models that would usually only order one product will order multiple instead. Be extra careful when managing your stock during this challenge and don’t fall behind on dresses! Everyone will order makeup products. All models will order makeup products today. Makeup products include the hairdryer, mascara, and hair straightener. To save time, try keeping an extra mascara on your tray. Products can only be restocked halfway! Products can only be restocked halfway today, meaning you’ll only be able to keep a maximum of 2 per item in stock today. Be extra careful when managing stock and restock items as needed. Congratulations! 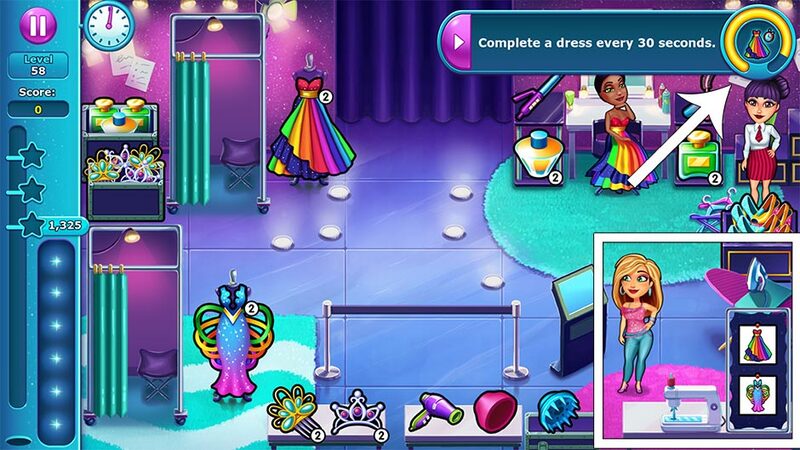 You’ve completed all the Fabulous – Angela’s True Colors challenges! Carl the mouse is back and hidden in every level of Fabulous – Angela’s True Colors. Can you find all 86 hidden mice? Scroll down to reveal the location of every mouse in the game. Numbers indicate levels. Numbers with a “B” stand for Bonus levels. Spoilers! Click to reveal secret level mouse locations! 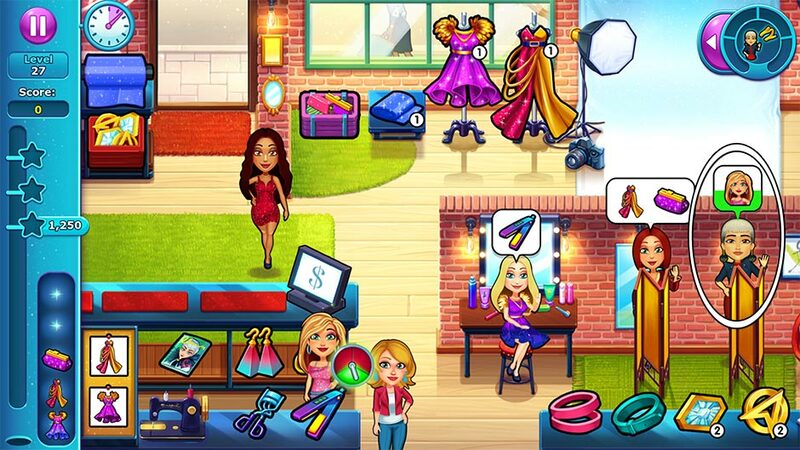 Show the world how fabulous you are with 17 unlockable trophies. Below is a complete list of all trophies and achievements, their descriptions, and how to unlock them. Achievements can be viewed in-game by clicking the trophy icon in the upper right corner of the level select map. Angela’s Sketchbook Complete the first level. Finish the Level 1 with at least 1 star. Noémie Complete the first chapter. Finish Level 10 with at least 1 star. Fran Complete the second chapter. Finish Level 20 with at least 1 star. Josh Complete the third chapter. Finish Level 30 with at least 1 star. Edward & Evelyn Complete the fourth chapter. Finish Level 40 with at least 1 star. Michelle Complete the fifth chapter. Finish Level 50 with at least 1 star. Angela Complete the sixth chapter. Finish Level 60 with at least 1 star. Amy & Paige Catch all the mice in the game. 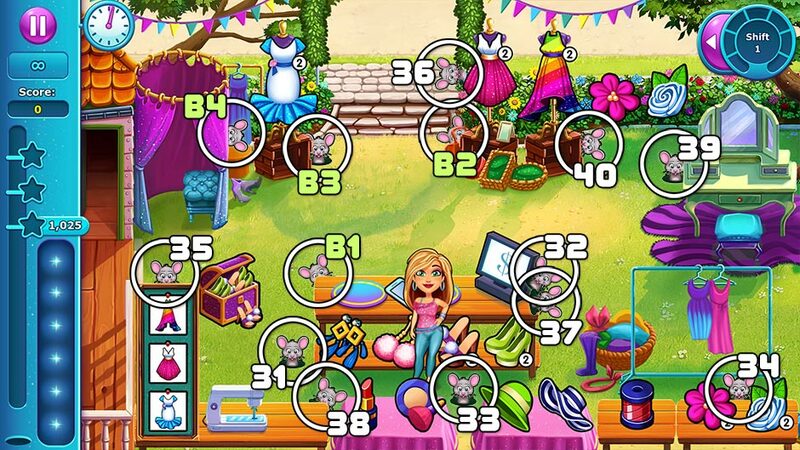 Find all 86 mice hidden across all story and bonus levels. See the Mouse Locations section for their locations. Murray Get three stars in every level. 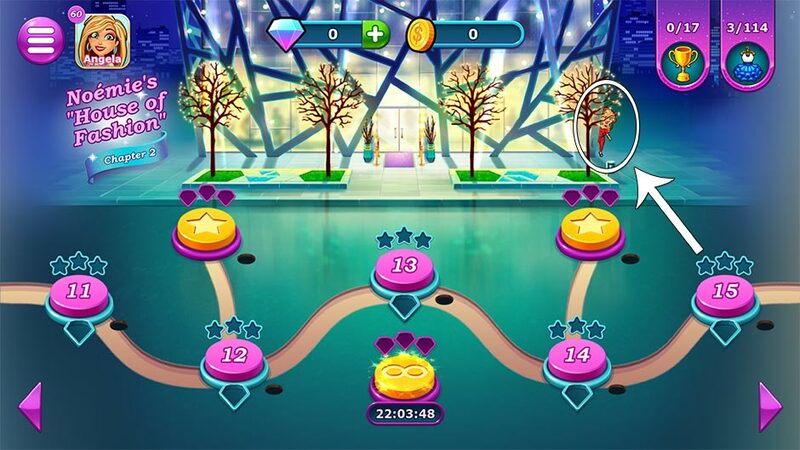 Finish story Levels 1 – 60 with 3 stars for each level. Jenny Buy all the upgrades in the game. Purchase 42 upgrades across all chapters. Upgrades can be purchased using coins after selecting a level on the level select map. Kitty Get at least 1 diamond in an endless level. Earn at least 1 diamond playing an endless level. Endless levels can be selected at the bottom of the level select map. A new challenge level can be generated every 24 hours. Virginia Make 100 dresses. Make 100 dresses using the sewing machine across all levels. Sally & Francois Serve 100 ecstatic customers. Serve 100 happy customers with a heart. Yuki Buy everything in the dressing-up screen. Select the dress-up tab in the upper right corner of the level select map. 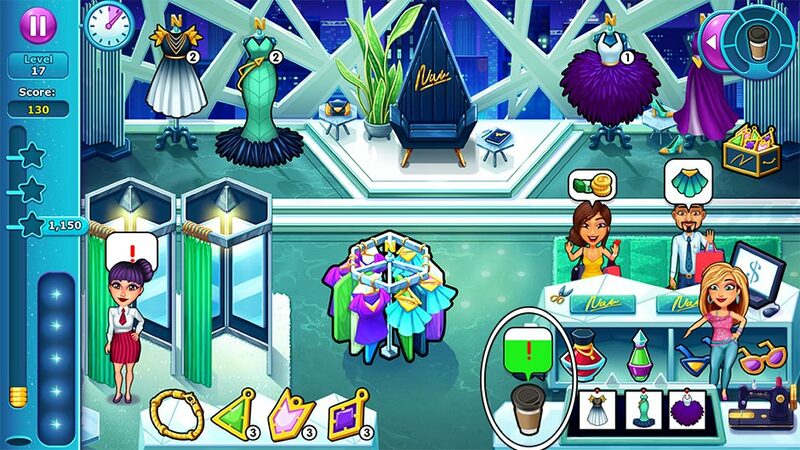 Using diamonds you’ve earned, purchase all possible clothing items. Note: Short on diamonds? 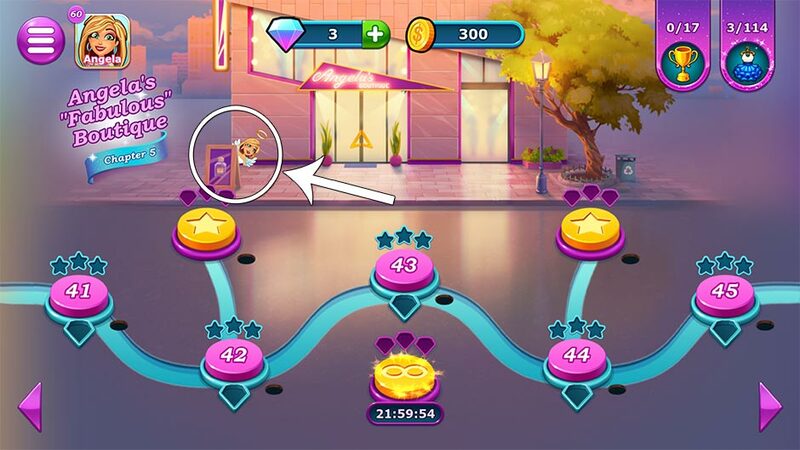 You can purchase more diamonds using coins you’ve earned by clicking the + icon next to your diamonds! Angel & Devil Complete the hidden Heaven & Hell levels. Find the hidden Easter Egg levels! For information on this achievement, see the Secrets section below. Neon Flamingo Make 50 Fabulous combos. Check out 5 or more customers at a time a total of 50 times across all levels. 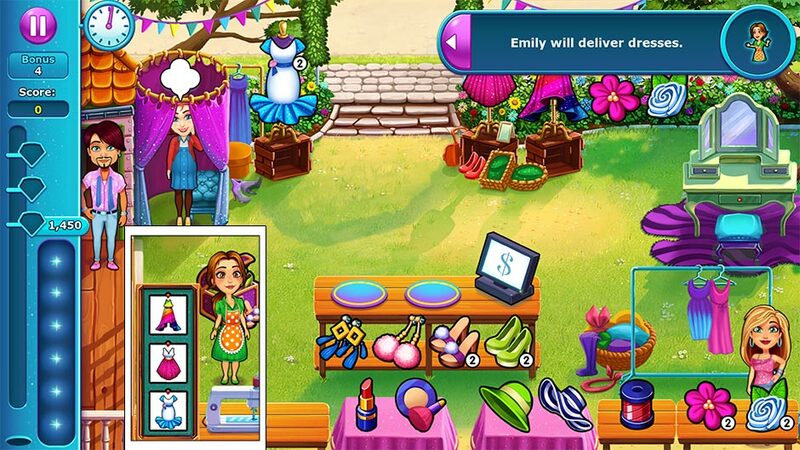 Emily Deliver every possible product in the game. Serve all products across all chapters and levels. There are a total of 83 possible product combinations. Tip! Missing a product? 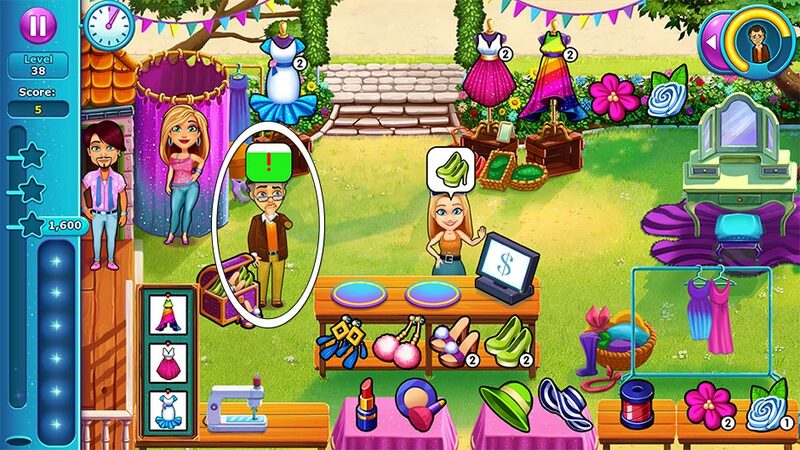 Try replaying the last level in a chapter where all products for that location are unlocked. Fabulous – Angela’s True Colors has a few secrets in store! Two fabulous Easter Eggs are hidden in the game. Learn how to find them and unlock their secret levels below! 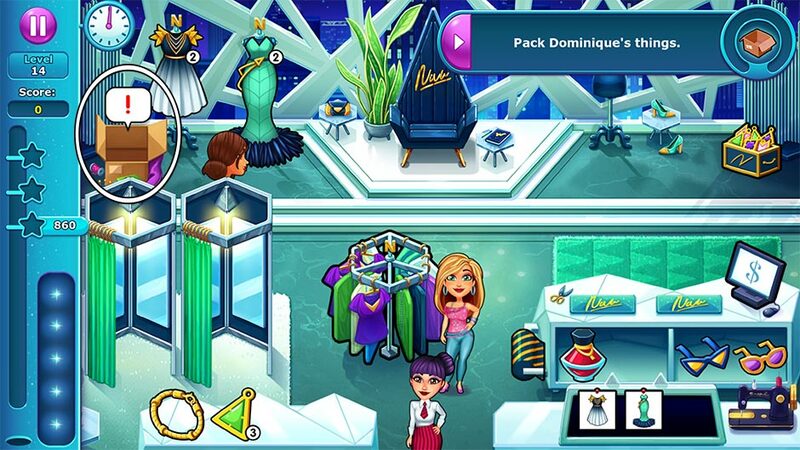 Once you’ve reached the end of Chapter 2, go to the Chapter 2 section of the level select map and keep a sharp eye on the right side of Noémie’s House of Fashion for a devilish surprise! Angela’s Devil will peek around the corner. Click on her to access a hidden level: Hell! Hell is an even more hellish version of Noémie’s House of Fashion. Play with Angela’s Devil as the hero and earn diamonds. You can replay this level anytime by clicking Angela’s Devil in the level select map where you found her before. Once you’ve reached the end of Chapter 5, go to the Chapter 5 section of the level select map and wait for Angela’s Angel to appear. You’ll find her peeking out from behind the fragrance sign on the left. Click on Angela’s Angel to access a hidden level: Heaven! Ah, heaven! 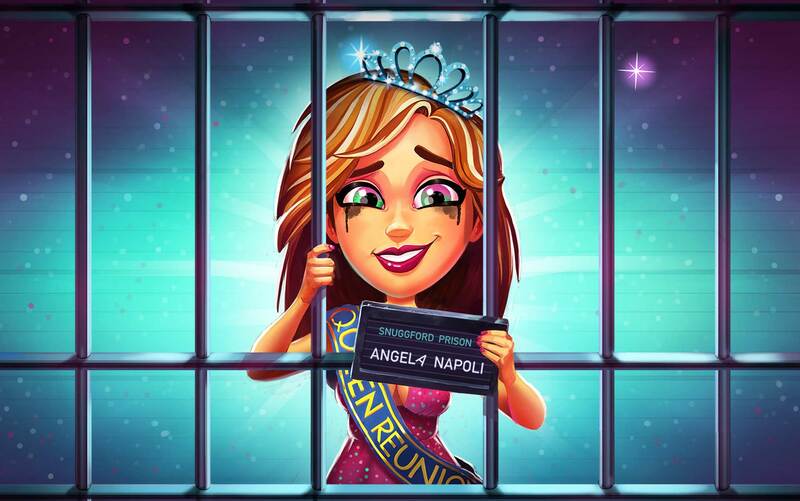 Play as Angela’s Angel in this divine level and earn diamonds. 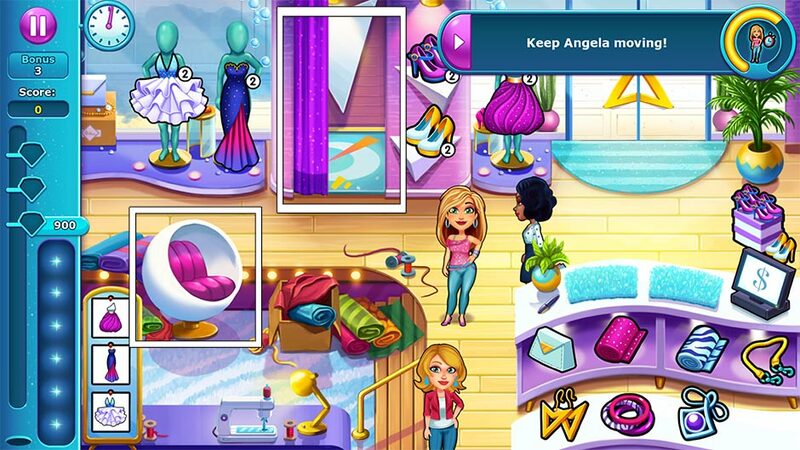 You can replay this level anytime by clicking Angela’s Angel in the level select map where you found her before. Are you encountering issues with your game? Do you need extra help finding something? Our fabulous Customer Support team is happy to help! Share this walkthrough with your friends using the social media buttons below!